Our Right To Bioidentical Hormones Is Being Threatened! 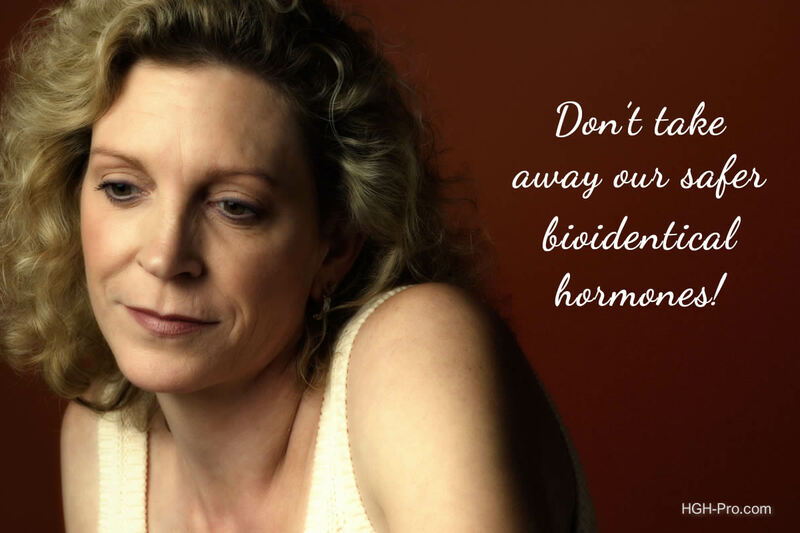 Our Right To Bioidentical Hormones Threatened! It seems that our right to safe and effective natural health products and supplements is almost constantly being attacked by Big Pharma. In 2005 Wyeth Pharmaceutical, who makes some of the most widely sold synthetic female hormone products- i.e., Premarin, Provera, and Prempro, filed petitions with the FDA against BHRT (bioidentical hormone replacement therapy) products. It appears they are hoping to have bioidentical hormones completely removed from the market in the United States, or at least have our doctor's right to prescribe them curtailed. Wyeth had watched their profits decline from $4.4 billion in 2001 to $1.2 billion in 2006 due to more patients and doctors choosing bioidentical hormones over synthetic. The sale of Premarin (conjugated estrogens) and Provera (medroxyprogesterone) has plummeted since the "Women's Health Initiative" (WHI) clinical study results were made public. Premarin and Provera were the hormones that were used in the study. Some women took Premarin only and others took both Premarin and Provera. This study was suppose to show how safe these synthetic hormones are, instead it showed the opposite. In fact, the U.S. government stepped in and stopped the study early due to the increased risk of blood clots, cancer, heart disease, and stroke in the group of nurses who were participating in the study. In the WHI study women taking Prempro (a combination of Premarin and Provera) had a 26% higher risk for breast cancer than those taking a placebo. It is important to note that only synthetic hormones were used in the WHI study. Bioidentical hormones were not used! Wyeth has tried to get bioidentical estriol off the market in the United States, claiming it was an unapproved drug that could be dangerous, yet they promoted their own bioidentical estriol product in Europe as a great and safe therapy for menopausal women! Estriol is one of the three estrogens made naturally by the body. The other two are estradiol and estrone. It seems that Wyeth found a way to patent bioidentical estriol in Europe by using a proprietary delivery system. How can the same bioidentical hormone be great for European women but be bad for women in the United States? Big Pharma seems to think it's fine for doctors to prescribe their Premarin (made from horse urine) and Provera products, all of which the human body sees as foreign and unnatural, even though theses products might possibly cause life threatening problems. They have a huge problem, however, when doctor's want to prescribe a safer plant-based hormone that is identical to what the human body naturally makes, that is, unless they can patent their own BHRT products. Big Pharma has never liked any natural substances because they cannot be patented. If a substance can't be patented the company can't make as much money selling it, and unfortunately, the number one goal of drug companies is to make as much profit for their shareholders as is possible. I feel we need to spread the word and also let the FDA know that we believe we have a right to safer and effective plant derived hormone products that are identical to the hormones our bodies make and do not have the risks that certain patented artificial hormone preparations have. I wrote the article above because I wanted everyone to know what has been going on. There are those who would like to see all bioidentical hormones as well as all non-prescription products and supplements taken off the market. Those of which I speak do not have our best interests in mind. They are interested in denying us access to safe and effective health products and nutritional supplements that may help to keep us healthier. It almost seems to me as though they would prefer we develop cardiovascular problems, diabetes, cancer, and other diseases of aging and nutritional deficiencies rather than allow us to use safe products and dietary supplements that may help to prevent or decrease our risks of these diseases. Watch television for only a few minutes and you will probably see at least one prescription drug advertisement. In the drug commercials have you listened to all the possible side effects and risks that they must disclose? I cannot understand how a drug company can expect the FDA to approve such drugs yet they think bioidentical hormones and other natural products should be removed from the market due to them being unsafe. As the saying goes; a healthy or healed patient is a customer lost! It seems that some drug companies want us to only take their medications that can just treat the symptoms, and some of which can cause dangerous side effects, and they require you to continue to take them for life. However, many of us would rather take a safe and effective natural product or nutritional supplement that aims to address the root of the problem. Bioidentical Female Hormones in Homeopathic Form! Women who feel they are still too young to start a full hormone replacement therapy (HRT) and also those who are afraid to take prescription HRT due to the risks they have heard about may wish to consider trying homeopathic hormones. Homeopathic hormones are safer and do not carry the risks that their non-homeopathic counterparts do. For instance, our OTC hormone products contain bioidentical hormones but in homeopathic form. Because the hormones have gone through the homeopathic process they can provide benefits without the side effects and risks some women are concerned about. For instance, we offer an FDA registered homeopathic product called ProBLEN Estrogen & Progesterone. It contains bioidentical estradiol, estriol, and progesterone, the same that is used in prescription HRT, but in homeopathic form. This product is designed to provide you with the therapeutic properties/energies of the hormone molecules it contains. Prescription HRT can shut down your body's own production of estrogen and progesterone, our product does not do this. It can help your body to balance and make more of its own E & P when needed.